Louis Burgess is a fire hydrant of comedy. Blapping bare mandem in the face with his unique blend of comedy, music and cashews, he can be seen up and down the country on most Wednesdays poncing about in the most disgusting of ways. Frequently described as “Bill Bailey on Crack” and “The Russell Howard of the Grungecore Folk Scene” he aims to create a new sub-genre within the genre of genre itself. Internet sensation Gary Powndland brings his unique perspective on life to the stage. Winner of the best live comedy show at the Midlands comedy awards and Wolverhampton’s favourite son, Gary is an act once seen never forgotten. 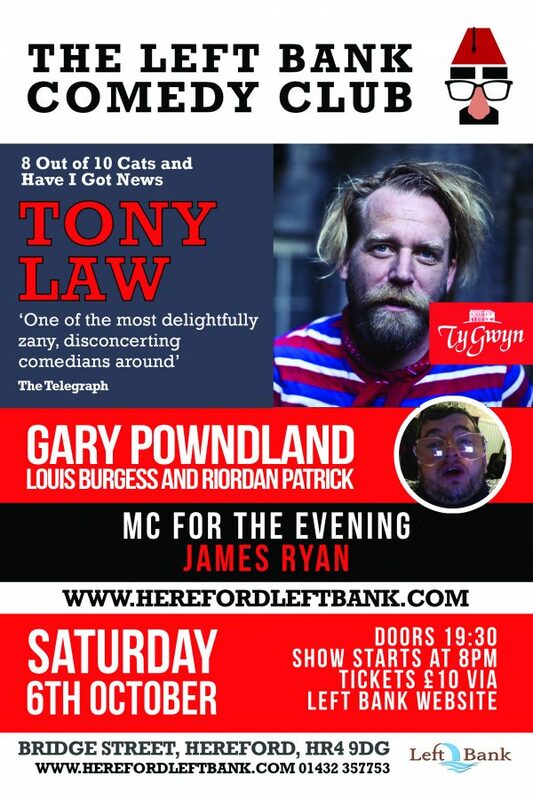 Tony Law is a four-time Chortle Award winner, Amused Moose Best Show winner, and Fosters Edinburgh Comedy Award nominee. In 2017 his BBC Radio 4 show, Tony Law: 21st Century Adventurer premiered, and he also starred in Tony Law & Friends in the Battle for Icetopia – a comedy play on ice. In 2018 he’ll be returning to the Edinburgh Festival with a brand new show.